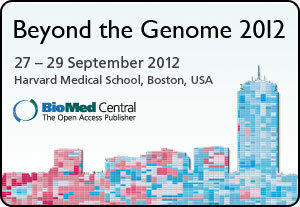 A few of us from DNAnexus had the privilege of attending Beyond the Genome 2012, a conference organized by BioMedCentral and held at Harvard Medical School. The meeting, now in its third year, continued its trend of attracting top-notch speakers, including keynotes from Baylor’s Richard Gibbs and Stuart Schreiber from the Broad Institute. From the first speaker, Gabor Marth from Boston College, it became clear that one of the major hurdles now facing scientists was not DNA sequencing, as has been true in years past, but processing the data. This has led to a situation where many groups are writing their own algorithms to perform the same functions — a widely recognized problem in allocating resources in the most productive way. Scientists encouraged each other to stop reinventing the wheel, and also to ensure that bioinformatics tools can be used and reported on easily by biologists. That message resonated with us, as we have long championed the concept of a central data resource where excellent algorithms would be accessible to anybody. It’s gratifying to see that the same principle is gaining acceptance throughout academia as easy-to-use, reproducible data analysis becomes the real challenge in the sequencing process. We also saw a string of fantastic talks on clinical sequencing. Sharon Plon from Baylor gave a very insightful “lessons learned” talk about their first year of clinical exome sequencing. The biggest pain point in the process was not sequencing, data analysis, insurance reimbursement, or finding patients in need; it was figuring out what to report to patients and how to do it. This underscores the need to bring genetic counselors, ethicists, and doctors into the conversation early to give guidance on what until recently has been a purely research-based endeavor. Dr. Plon and Joris Veltman from Radboud University presented several amazing case studies where sequencing had identified the cause of disease and allowed the patient to make steps to improve their lives, as well as informing the family about risk of recurrence. We look forward to hearing many more success stories. Of course, cancer studies were a noteworthy trend at the conference. We heard research on cancer genome evolution, epigenetic modification, sifting causative mutations from neutral, and the general effects of genome organization in three dimensions. But it was clear that integrating the information that’s being generated from all these techniques will be a big challenge. To get even deeper insights into human cancers, we’ll need to bring together the computational tools that we’ve already built and also bring together people from different scientific, medical, and social disciplines to apply that information intelligently. 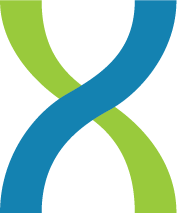 The good news is that this is already starting to happen, and we at DNAnexus are excited to be in a position to offer help as this approach gains traction.